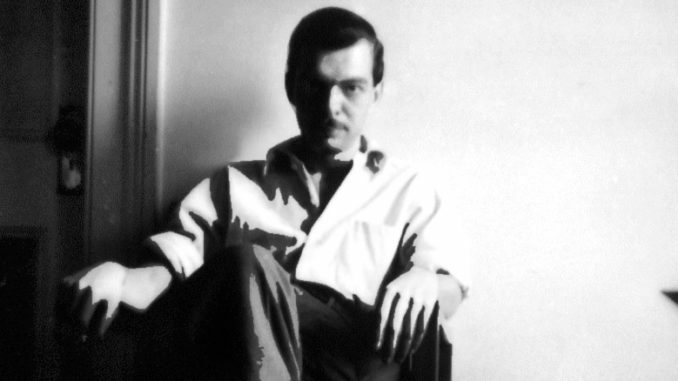 Weldon Kees belongs to the circle of American authors who left us early, in some cases by their own hand: Stephen Crane, Frank Norris, Hart Crane, F. Scott Fitzgerald, Sylvia Plath, Anne Sexton, David Foster Wallace. He was part of a particularly doomed cohort, poets born in the year of World War I, 1914. Randall Jarrell took his life in 1965, wading into traffic. John Berryman committed suicide in 1972. Only William Stafford escaped the curse of that year among poets of significance, living out his natural span. Weldon Kees disappeared on a July day in 1955, leaving his car parked beside the Golden Gate Bridge, with no note behind. No trace of him was ever found. The assumption, and finally the legal conclusion, was that he had committed suicide. He certainly left the world he’d been living in, where his growing reputation was still being made. Perhaps that fact alone was all the statement he wished to make. We can’t, though, dismiss him with that—the presumption that, with whatever private demons haunted him, he was after all dismissing us. The poetry compels us to give him attention, and it draws us back not only to the man but the time in and of which he wrote. Kees came of age in a singularly troubled time. Born into the Great War, he came of age in the Great Depression, the age of totalitarian dictators, and World War II, with its unexampled loss of life and its horrific pendants, the Holocaust and the atomic bomb. The postwar decade was one of revived prosperity, and, for America, dominion over much of the globe. But it was also a time of strife, with great revolutions in Central and East Asia, the collapse of the old imperial order, and, above all, a deep and pervasive anxiety. The atomic age, with its rapidly developing and proliferating thermonuclear arsenals, presented not merely the religious imagination but the practical political world with the prospect of apocalypse. Politicians and generals prepared for nuclear conflict, even as such conflict portended a world without conceivable victors and a planet perhaps unfit for human habitation. Humanity was presented, for the first time, with a situation that could neither be accepted nor avoided. How to live in such a situation, for those most sensitive and alert to it, was a challenge without an apparent solution. Weldon Kees was multiply gifted, and the restlessness with which he pursued his gifts was not only evidence of a rare energy but of a desperate effort to describe and embrace a world that, in the simplest terms, made no sense. He painted—well enough to be exhibited with the major figures of Abstract Expressionism at their signature gallery, the Peridot—; he photographed; he made documentaries; he played and composed jazz. He illustrated a book called Non-Verbal Communication in collaboration with a California psychiatrist, Jurgen Ruesch, as if to suggest the bankruptcy of words in the moment he faced, and that the bare testimony of images that was perhaps all that remained. Yet, at the same time, he was and remained primarily a poet. Kees published two collections in his lifetime, The Last Man and The Fall of the Magicians. The first title suggests his own stance in the face of the gathering and then breaking war, the second his bitter response to those, particularly the scientists, whose labors had brought about the end of history: the moment, that is, from which humanity could no longer imagine a future. Kees left behind what might have been a third manuscript, which his editor, Donald Justice, arranged as Poems 1947-1954, and some miscellaneous work from various points of his career. The whole makes for a slender volume, 180 pages in all, but not an insubstantial one for a career cut short at forty-one. It was all the poet wished to say, and, although we might desire more it is, in its fragmented way, somehow complete. It leaves us where we still ourselves are, at an edge. A movie of death . . . The sharp dead click of chocolatebar machines. . . . Your heritage, the logic of your destiny. The talkies were still relatively new at this time, and the seductiveness of spoken dialogue was, in a manner we now lack (or simply take for granted) a fascinating and deeply manipulative part of a film’s verisimilitude and the more intimate, ‘natural’ acting style it enabled. Kees’ film replaces this—replaces language—with a suggestion of animals (or humans?) being led to the slaughterhouse, guns rumbling in their lethal sequence, and the fatal click of a mindless technology that offers pleasure but, like the exitless theater itself, locks one into a space without escape, a destiny without hope. Speech, for Kees, is not only inadequate, but existentially compromised, corrupted by history, and imposing itself on perception at its very source: for we not only speak but see through words, entangled at the root with what they say. In “Variations on a Theme by Joyce,” the opening clause of the poem’s repeated line, “The war is in words,” suggests the snare of language, which both prefigures action and defines possibility. The “war,” that is, is here before it happens in the linguistic imagination through which it takes shape, and in that sense both fully present and never-ending. The overwhelming sense of the 1930s, particularly after Munich, was that the war dreaded since the advent of Hitler was not only inescapable but already underway, lacking only the bloodshed that would soon certify it. Nor, as Kees understood, would America’s oceans shield it: distance was nothing to the imagination, and navies not the defenders but the bringers of war. TWO STRANGERS: We have built Jerusalem in England’s green and pleasant land. The “strangers” declare they have already built Jerusalem in Blake’s land, perhaps referring to the Churchillian democracy that Orwell, writing at the same time, thought worth defending with all its flaws; but the old man sees something else at work, the impersonal force he calls “process” that unfolds as fatality, and, without the volition and choice that notionally makes for history, leads only to a final impasse. It is of the perception that Yeats had had of “things” in the saddle, riding men, but now applied to a conflict of even greater scale. With its justly famous view. We’ll see them before we’re through. Toward the late news, accompanied by screams. “Report on the Meeting” twists its irony in several ways. The scientists who work to prolong life while death surrounds them on all sides are, in fact, its chief enablers, since the lives they work to save at the expense of creatures great and small are precisely those whose destruction their weapons of war have facilitated. Whether we may read this as well as a commentary on the atomic bomb, or associate Faustian science with the “magicians” whose fall the book’s title denotes, no other group comes in for such specific and searing condemnation. Farewell, colleagues of the sublime! Which ticks like a bomb, and is not culpable. The clock, perhaps, is that of prophecy, and the warning the poet sounds may, like a fire signal, only seem to bring the flames closer by announcing them. Clearly, Kees also has in mind the aestheticism that seeks to avoid ‘culpability’ by seeking refuge in a purely cognitive realm: Stevens may be his model here. Nonetheless, the product of such activity—of man figured as the “magician” of himself—“ticks like a bomb” as well. Or where the chair would be if Robinson were here. Robinson walking in the Park, admiring the elephant. Robinson is activity, Robinson is assertion, but none of this makes a self. We find him, further, playing cards, taking a taxi, staring downwards from a rooftop, prepared to play golf, describing a tour of Russia, “afraid, drunk, sobbing,” and also in bed with a “Mrs. Morse.” The inventories go on, culminating in a meticulous account of his dress, his wardrobe, his various appurtenances, and finally “His sad and usual heart.” Even the latter, however, is no more than an “aspect” of him, simply another layer in a pile with no bottom. “This is Robinson,” as Robinson says, is not an affirmation of identity but the sum of its absence. We infer a well-tailored, well-traveled bourgeois who appears here and there doing this and that, and who answers to a certain set of syllables that connotes a name. But there is no more than that. It is not because there is no individual, substantial reality behind the set of attributes that passes for “Robinson,” but that there is no such reality for anyone because there is no longer any civilization to validate it. We are not, Kees suggests, self-authenticating persons in general, but figures composed, linguistically, materially, and morally, of the civilization that grounds and supports us—itself a larger fiction, but one sufficient for purposes of individuation. That civilization had existed, and produced the distinctive intelligences who populate Kees’ early verse—Joyce, Proust, Henry James—but it no longer props up the postwar world, having left only simulacra of itself. Robinson can visit the zoo, read his papers, and put on “The jeweled and silent watch that winds itself.” He can even contemplate suicide from a roof. But there is not enough of him to genuinely despair, and without despair he cannot even perceive his own derealization, the loss of that which makes persons possible. The waking Robinson identifies with none of these possible selves, but thinks only, “’There is something in this madhouse that I symbolize’”—that is, that he himself, as the sum of the sequence, leads only to further figuration. The poem leads merely to a frighteningly empty prospect in which the empty wind of being blows “long curtains” into a room occupied, finally, only by a void. The last of the Robinson poems, “Relating to Robinson,” finds the poet—or at any rate the speaker of the poem—appearing to recognize Robinson on an empty urban street. The speaker knows Robinson is elsewhere, for it is summer and Robinson spends his summers fashionably; nonetheless, the resemblance is such that he “almost” calls out to him. Coming abreast, he turns to look at ‘Robinson’s’ face, only to be greeted by “terrifying eyes” that stop his blood. The figure speaks disjointedly with horror, but also with an implied familiarity (“’You must have followed me from Astor Place’”), the voice suggesting “an echo in the dark.” The speaker, that is to say, recognizes the No One who is both ‘Robinson’ and himself. He flees from the apparition, to find himself once more alone. Robinson may also represent something else, Kees’ “last man” who is and is not the poet himself. He is, at any rate, inseparable from him—not a proof of existence, but of nightmare. The frightening double who appears in “Relating to Robinson” becomes a vaguely fragmented series in “Furies,” whose speaker notes “Not a third who walks beside me / But five or six more.” These latter, this “retinue / of shadows,” are a shape-shifting tribe of monsters, “A harelipped and hunchbacked dwarf / . . . / Who jabbers the way I do”; a sinister “clown” who turns into “a man with a mouth of cotton / Trapped in a dentist’s chair.” Each figure becomes more hideous than the last, returning the speaker to the terrors of childhood where “We enter a thousand rooms / That pour the hours back”—a labyrinth that leads only to the most inexpressibly primal terror of all. When the doctors turn the current on. Where hell spreads thin between the bars. The poem proceeds through a catalogue of human ailments, presumably to be investigated by animal experiment, before returning to “that room / Where a room of cats danced, spat, and howled / Upon a burning plate,” and concludes, “I was home.” ‘Home,’ that is to say, is where the animal subjects are tortured into mimicking a human activity, dance, even as they writhe and howl with pain; home is “hell,” and there is nowhere else. So many eager smilers to be killed. The wind is cold, and there is only darkness at our backs. If the poet is the canary in the coal mine, then the fate of the cohort of 1914 tells us something about the world that emerged from the Great Depression, World War II, and the postwar world of American empire. Like Kees, Randall Jarrell and John Berryman came to their own ends through a complex combination of circumstances, but a common thread of isolation and alienation runs through their work, and the title of one of Jarrell’s last works, A Sad Heart at the Supermarket, epitomizes the sense of what Kees himself called in “The Clinic” the “desiccation” of modern life. At the juncture where we ourselves stand, with an empire that has metastatized around the globe, an ethos of empty consumption, and a social infrastructure that is crumbling visibly beneath us, Kees’ work is both a warning and a challenge. Is Humanity a Lost Cause?